Trophic cascade theory predicts that predator effects should extend to influence carbon cycling in ecosystems. Yet, there has been little empirical evidence in natural ecosystems to support this hypothesis. Here, we use a naturally-occurring trophic cascade to provide evidence that predators help protect sedimentary organic carbon stocks in coral reef ecosystems. Our results show that predation risk altered the behavior of herbivorous fish, whereby it constrained grazing to areas close to the refuge of the patch reefs. Macroalgae growing in “riskier” areas further away from the reef were released from grazing pressure, which subsequently promoted carbon accumulation in the sediments underlying the macroalgal beds. Here we found that carbon stocks furthest away from the reef edge were ~24% higher than stocks closest to the reef. Our results indicate that predators and herbivores play an important role in structuring carbon dynamics in a natural marine ecosystem, highlighting the need to conserve natural predator-prey dynamics to help maintain the crucial role of marine sediments in sequestering carbon. There is growing evidence from a wealth of ecosystems that predators, via trophic cascades, play an important and potentially irreplaceable role in carbon (C) cycling (Wilmers et al., 2012; Atwood et al., 2014a,b; Schmitz et al., 2014), and that changes to predator populations can alter CO2 concentrations and emissions from ecosystems (Schindler et al., 1997; Atwood et al., 2013; Hammill et al., 2015), C export from erosion (Coverdale et al., 2014), and C storage in plant biomass (Hawlena et al., 2012; Wilmers et al., 2012; Strickland et al., 2013; Heithaus et al., 2014). Yet, the influence of predators on one of our most important long-term C storage pools, marine sediments, has rarely been explored (although, see Coverdale et al., 2014 on the influence of predators on C loss from salt marsh soils). Our study investigates how predators, through a naturally occurring trophic cascade, protect relatively young (0–40 years) and old (40–110 years) sedimentary organic carbon (OC) stocks in a coral reef ecosystem. Marine ecosystems dominated by benthic macrophytes (seagrass, mangroves, salt marsh, and macroalgae) are important reservoirs in the global C cycle. Marine macrophytes represent ~75% of marine autotrophic biomass (Smith, 1981; Gattuso et al., 1998), and coastal ecosystems dominated by macrophytes have the capacity to store large deposits of OC in their sediments (Fourqurean et al., 2012; Duarte et al., 2013; Krause-Jensen and Duarte, 2016; Atwood et al., 2017). The capacity of macrophyte systems to naturally sequester and store C in their sediments for millennia identifies these habitats as important C sinks (Nelleman et al., 2009; Duarte et al., 2013). Thus, it is crucial that we understand the important mechanisms that influence C accumulation and preservation in the sediments of these systems. Herbivory is an important ecological process that can influence characteristics of the macrophyte community that underlie C deposition in marine systems. First and foremost, herbivores and grazers remove plant biomass that otherwise could be incorporated into the sediments (Rose et al., 1999; Atwood et al., 2015). A meta-analysis on the fate of macrophyte production suggests that 9–33% of macrophyte biomass returns to the biological pool through the process of herbivory, with the highest rates from macroalgal systems (Duarte and Cebrián, 1996). Second, grazers can alter the physical structure of the system by directly altering canopy height through consumption. For example, in Moreton Bay (Australia), grazing by dugongs reduced seagrass shoot density by 65–95% and above-ground seagrass biomass by 73–96% (Preen, 1995). The canopy and roots of macrophytes provide the necessary physical structure that allows allochthonous sediments and C being transported through the water column to be captured and accumulated in the macrophyte sediments. Clipping experiments have suggested that a 50% reduction in canopy height of seagrass can reduce sediment accumulation rates and increase sediment resuspension by 10-fold (Gacia et al., 1999). Despite evidence that herbivores influence the structure and composition of macrophyte communities, no study to date has investigated herbivory as a potential driver of spatial variation in marine sedimentary C deposits in a coral reef system. Figure 1. Grazing halos. (A) Satellite image of macroalgal “grazing halos” in Australia's Heron lagoon. Image copyright Digital Globe and Google Earth. (B) Hypothesized non-consumptive effects of predators on grazing intensity, algal biomass, and sedimentary carbon stocks. The risk of predation constrains herbivore abundance to areas close to the reef, leading to reduced grazing, increased algal biomass, and increased sedimentary carbon stocks (brown boxes with “C”) and sequestration (curved, black arrows) with increasing distance from reef refuges. It has been hypothesized that trophic cascades are responsible for concentrating herbivore abundance and grazing close to the refuge of the reef. A trophic cascade is the indirect and alternating effect of predators on lower trophic levels. Trophic cascades can be initiated as a result of predators consuming prey, which in turn reduces the preys' effects on their food source (density-mediated trophic cascade), or non-consumptive effects where the prey alters its foraging behavior in an attempt to avoid predation (behaviorally-mediated trophic cascade; Ripple et al., 2016). Although not well tested, it is thought that anti-predator shifts in herbivore foraging behavior are one of the underlying mechanisms behind the concentration of grazing close to patch reefs, which ultimately leads to halo formation (Madin et al., 2016; Gil et al., 2017). This risk of predation can create a “seascape of fear,” whereby spatial variation in prey and primary producer biomass are inversely related as a function of predation risk levels across space (Brown and Kotler, 2004; Madin et al., 2010, 2011). If halos are indeed created by consumptive (lethal) and/or non-consumptive (risk) effects of predators, the poorly vegetated sediment surrounding patch reefs represents a zone of low predation risk, where herbivores can feed relatively close to a refuge. Conversely, the adjoining macroalgal or seagrass meadows represent areas in which it is generally too risky to forage. Although the removal of vegetation due to grazing has obvious impacts on the distribution of plant biomass (Silliman and Bertness, 2002; Wilmers et al., 2012; Heithaus et al., 2014), and thus C cycling though photosynthesis (Wilmers et al., 2012), at present we do not understand whether these changes to vegetation have legacy effects on OC stocks in marine sediments. In this study, we investigate whether predators shape the distribution of sedimentary OC stocks by altering the abundance and foraging behavior of herbivores, which in turn alters benthic algal biomass and distribution (Figure 1B). We hypothesized that the occurrence of grazing halos in the Great Barrier Reef's Heron lagoon result from trophic cascades (Figure 1B). We predicted that, as on patch reefs elsewhere, the increased risk of predation with increasing distance from the refuge of the reef would result in a shift in herbivore behavior that would reduce grazing pressure and increase algal growth with increased distance from the reef edge. Furthermore, we predicted that the indirect effects of predators on the distribution of benthic algal biomass would have legacy effects on sedimentary OC stocks, with increased stocks at greater distances from refuges. This study helps us understand whether and how predator-prey interactions influence the distribution of sedimentary OC stocks in coral reef ecosystems. Such an understanding is becoming increasingly important as natural and anthropogenic disturbances continue to alter marine communities in our greatest C sink (Sabine et al., 2004), the ocean. This study was conducted on 22 patch reefs and their respective surrounding grazing halos within the shallow lagoon (total area 9.3 km2) of Heron Reef in Australia's Great Barrier Reef Marine Park (23° 27′ S, 151° 55′ E). We focused our surveys on sheltered lagoonal reef habitat, which is typically shallow (< 5 m) and features patch reefs isolated from one another by expanses of bare or algae-covered sand. Patch reefs that contained boulders, large coral fragments, or other hard substrates within the halos were not used in our study as these additional structures had the potential to influence fish behavior and algal growth. Furthermore, over the course of the surveys, selected patch reefs maintained a distinct separation between the edge of the reef and the sand flat. Heron's reef system represents the ideal location to study the effects of trophic cascades on sedimentary OC storage because its reefs have relatively intact predator and herbivore populations relative to other reefs that have been more impacted by fishing. Furthermore, satellite imagery has documented the occurrence of grazing halos in the algal beds surrounding patch reefs in the Heron lagoon dating back to at least 1999 (Figure 1A), although the formation of the halos almost certainly pre-dates the availability of high-resolution satellite imagery for this area. This study was carried out in accordance with the Great Barrier Reef Marine Park Act (1975) and all protocols were approved by the Great Barrier Reef Marine Park Authority (Permit numbers: G14/37304.1 & G14/37182.1). No vertebrate fauna were taken or harmed, and no endangered or protected species were involved in this study. To quantify fish abundance and behavior, we deployed five GoPro underwater video cameras (www.gopro.com) in 2013. The cameras were anchored to the substrate and formed a line transect from the reef to the algal meadow. Cameras were placed at the center of the patch reef, and 2.5, 7.5, 15, and 22 m from the outer margin of the reef. A marker was positioned at a distance of 3 m in front of each camera to mark the end of the observation area. The camera's field of view at 3 m distance was 5.6 m wide. Recording times ranged from 119 to 285 min (mean ± SD: 215.49 ± 48.6 min) per camera. Remote underwater video surveys are becoming an important tool for assessing fish abundance and have several advantages over visual surveys. First, video surveys offer a permanent record that can be reviewed by others. Second, remote video surveys have minimal or no effect on fish behavior. This aspect was very important for our study, which aimed to examine changes in prey behavior with increasing predation risk. In the laboratory, video footage was viewed on a computer screen, and all fishes passing through the defined field of view were recorded. We recorded the time, activity type (passing or foraging), and activity duration (in seconds) for each observation. In order to minimize overestimation of the number of roaming fish, we established a time threshold of 3 min between repeated occurrences of the same species to consider it as a new observation. We classified each fish to the lowest taxonomic level possible. For most observations, fish were identified to species level. Fish were further grouped into the following trophic categories: (i) herbivores: species that primarily feed on plant and detritus material (e.g., surgeonfishes, rabbitfishes, parrotfishes, and damselfishes other than planktivorous damselfishes), (ii) predators: species that feed mainly on fishes or invertebrates (including both top predators and meso-predators). For our analyses, however, we did not use the entire herbivore and predator data set. Rather, we only used data from herbivore species that we observed to actively forage on algae inside the halo (Acanthurus spp., Zebrasoma veliferum, Naso unicornis, and Signaus canaliculatus) and their predators (Galeocerdo curvier, Carcharhinus melanopterus, Negaprion brevirostris and jacks). We grouped meso-predators (e.g., jacks) and top predators (e.g., G. curvier) into a single group because we were interested in all the potential predators that could directly prey on our herbivore species. Furthermore, identifying a shark's trophic position without local diet data can be troublesome as a shark's trophic position can be influenced by not only the species of shark, but also its ontogeny, body size, behavior, and habitat (Heupel et al., 2014; Frisch et al., 2016; Roff et al., 2016). From our video records, we calculated the observed number of individuals per hour of video footage, and for foraging fish the number of bites per fish, per minute of video footage, as well as the time spent foraging. For the time spent foraging, the behavior ended when the fish began displaying a different behavior (i.e., resting) or when the fish left the camera frame. This means that fish may have foraged for longer periods than what was recorded by cameras. For each observation we identified the tidal stage (±3 h either side). Because this study was conducted over the course of several weeks and tides shift ~1 h each day, tidal stage was not confounded with time of day. All videos were collected during daylight hours. Grazing assays using Enteromorpha spp. (previously identified as Hincksia sp. ), were conducted by Madin et al. (2011); grazing assay data were reanalyzed for this study using the statistical methods described below. At each fish survey location, with the exception of on the reef, we calculated percent algal cover using benthic photo-quadrats (25 × 25 cm PVC pipe frame). We did not collect percent algal cover on the reef because we it is a vastly different substrate type compared to the sand flats and because Enteromorpha spp. was not found growing on the reef. Benthic quadrat images were analyzed with CoralNet online software (www.coralnet.ucsd.edu). One hundred dots were automatically laid over each quadrat and the substrate below each dot annotated. The substrate categories used in this study were sand and turf algae. In addition to percent cover, algal canopy height was also measured. Here, algal canopy height was measured with calipers to the nearest mm at distances of 0 m (directly off the reef), 2.5, 7.5, 15, 22, and 30 m from the outer reef edge. These distances were selected to match those from the carbon stock collections (see below). Because of weather constraints, which restricted access to the furthest and deepest patch reefs, only 15 of the original 22 patch reefs included in the fish and percent algal cover surveys were sampled for algal canopy height and carbon stocks. In conjunction with algal canopy height (see above), two sediment cores from each distance at each reef were collected with a hand corer. Sediments from the first core were used to measure sedimentary OC stocks and total nitrogen concentrations. Sediments from the second core were analyzed for mean particle grain size using a Mastersizer particle size analyser (Malvern Instruments, Malvern United Kingdom). Cores were separated into surface (0–5 cm) and subsurface (5–14 cm) sediments. We wanted to provide evidence that the halo formations have had both short- and long-term effects on OC stocks. Based on Heron lagoon sedimentation rates (a method used to estimate the date of deposition) of 0.126 ± 0.14 cm yr−1 (Smith et al., 1998), surface sediments (0–5 cm) represent relatively young OC accumulation (over the past 40 years) that has occurred since the Great Barrier Reef Marine Park Act of 1975 was enacted, while subsurface sediments (5–14 cm) represent OC accumulation over the past century (40 to ~111 years). Stable isotopic δ13C signature of the surface and subsurface sediments were significantly different (P < 0.001), suggesting that there was little to no mixing between the two depth measurements during core extraction. Sediment samples were dried at 60°C to a constant weight. Dry bulk density was calculated as the dry weight of the sediment sample divided by the volume of the core. Sediment samples were then finely homogenized and divided into two subsamples for OC stock assessment and stable isotopic δ13C signature analysis. Sediment samples, regardless of depth or distance from patch reefs, were predominantly inorganic carbon (>90%). As a result we used the Campbell et al. (2014) burn method to estimate OC. Bulk density and percent OC were combined with core depth (either 5 cm for surface sediments or 9 cm for subsurface sediments) to obtain per-area sediment OC. We used stable isotopic δ13C signature analysis to determine major sources of OC to the sediments and whether C sources varied with distance from refuges. Within the halos we collected abundant and common primary producers. Enteromorpha spp. was the most dominant algae and almost exclusively made up the grazing halos. In addition to Enteromorpha spp., we also collected Hydroclathrus sp., whose abundant detached fragments accumulated in depressions in the sediment. Surface sediment subsamples analyzed for stable isotopic δ13C signature were acidified using 1M HCl to remove all inorganic C. Algal samples were thoroughly washed, but not acidified. Sediment and algal samples were analyzed for stable δ 13C isotopic composition using an elemental analyzer coupled to an isotope ratio mass spectrometer at the University of Hawaii at Hilo. Stable isotope results are presented as deviations from Vienna Peedee Belemnite (VPDB) with a measurement precision of ± 0.2%0. A two-source mixing model was used to quantify the proportional contribution of OC by Enteromorpha spp. and Hydroclathrus sp. to halo sediments. Linear mixed effect (LME) models incorporating quadratic terms were used to quantify relationships between distance and each of algal canopy height, percent algal cover, δ13C signature of the sediments, grazing assays, individual herbivore bite rates and time spent foraging. Time spent foraging was normalized using a square root function to account for the fact that the size of the residuals progressively increased with distance. We used generalized linear mixed effects models with a Poisson distribution, as the data were zero inflated, to investigate the independent and interactive effects of distance and tidal stage (high and low) on predator and herbivore fish distributions. Finally, we used LME models to investigate the effect of distance, sediment grain size and the total N concentration in the sediments on algal height. To investigate factors affecting sedimentary C stocks, we used a LME model with a quadratic term for distance and a linear term for algal canopy height. Quadratic terms were included to allow for curvilinear relationships between distance and each response variable. If the quadratic distance term was found to be non-significant, it was removed and the model was re-run (as was the case for surface sediments), to test if a linear relationship existed between distance and the response variable being tested. Within each model, “reef identity” was included as a random effect to account for unmeasured, between-reef differences and avoid issues relating to pseudo-replication. For all models we used step-wise removal of non-significant terms for model selection. For all graphical representations of our mixed effect models (Figures 2–4), we show the fixed effects, while accounting for the random effect, by approximating the means and 95% confidence intervals using the “predictSE.lme()” function in the “AICcmodavg” package in R. All analyses were conducted using the statistical programming package R (R Development Core Team, 2016). Figure 2. Effect of predators on herbivore abundance. (A) Mean number (± s.e.) of predators observed per hour in Heron lagoon during high and low tide on the reef and with increasing distance from patch reef edge. (B) Mean number (± s.e.) of herbivores observed per hour in Heron lagoon during high and low tide and with increasing distance from patch reef (i.e., refuges). We found that the abundance of herbivores and large bodied predators differed with distance from the reef and between tides. Based on the species observed, predators were predominantly roving predators. Predator abundance was influenced by a significant interaction between distance and tide (distance × tide, P = 0.002; Figure 2A). Although for both high and low tide, predator abundance decreased with distance from the reef (P < 0.001), their abundance was about five times higher during low tide compared to high tide (P = 0.036). Herbivore abundance was greatest during high tide (tide: P = 0.030; Figure 2B) and at distances closest to the reef edge (distance P < 0.001). Furthermore, herbivores ventured further from the reef edge at high tide compared to low tide (distance × tide: P = 0.016; Figure 2B). Grazing assays using Enteromorpha spp. (the most common algae growing around the halos) showed that grazing decreased with distance from the reef (P = 0.005), with herbivores removing 68% more algae closest to the reef edge compared with the furthest point on the transect (Figure 3A). 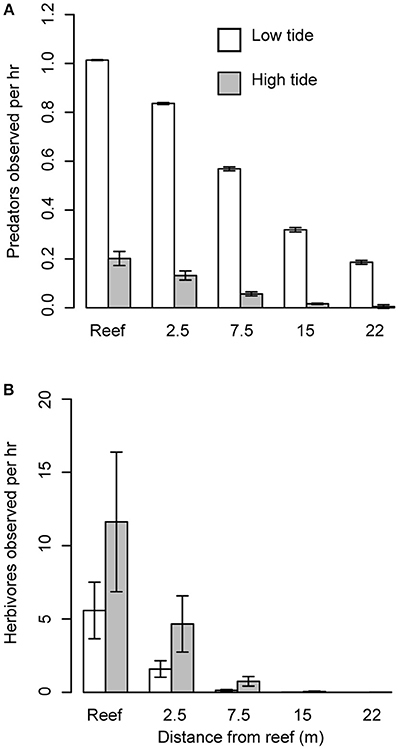 Herbivore individual bite rates were found to increase with increasing distance from the patch reef (P < 0.001; Figure 3B), while time spent foraging decreased with distance (P < 0.001; Figure 3C). Figure 3. Grazing intensity and its effects on algal growth with increasing distance from patch reefs. (A) Mean percent algae removed (± s.e.) with increasing distance from patch reef following 72 h grazing assays. (B) Mean individual bite rates (± s.e.) by herbivores with increasing distance from patch reefs. We did not observe any herbivorous fish foraging at distance >7.5 m from the reef edge. (C) Mean herbivore foraging time (± s.e.) with increasing distance from patch reefs. (D) Mean algal canopy height (± s.e.) with increasing distance from the patch reef. (E) Mean percent algal cover (± s.e.) with increasing distance from the patch reef. We found that algal canopy height and percent algal cover significantly increased with distance from the reef edge (both P < 0.001; Figures 3D,E). Neither sediment grain size nor total nitrogen concentrations in the sediment showed a significant effect on algal height (all P > 0.05). OC stocks collected from surface sediments (0–5 cm) were positively affected by both algal canopy height (P = 0.027) and distance (P = 0.005) from the reef edge (Figure 4A). Because of the significant effect of distance on algal height, we investigated the variance inflation factor using the function “vif()”in the “CAR” package in R to determine the extent of co-linearity between the two factors. The variance of inflation factor was 1.491, suggesting only weak co-linearity. To further determine the validity of maintaining algal height in the model, we performed a likelihood ratio test. Here we found that the inclusion of algal height as a predictor variable marginally improved the model (P = 0.057). Subsurface OC stocks (5–14 cm) also increased with distance (P = 0.046), but did not significantly co-vary with algal canopy height (Figure 4B). Subsurface OC stocks had a curvilinear distribution with distance, where stocks remained relatively constant between 0 and 15 m from the reef edge, before rapidly increasing (Figure 4B). Figure 4. Sedimentary carbon storage in a seascape of fear. (A) Mean (± s.e.) sedimentary organic carbon (OC) in surface (0–5 cm) sediments with increasing distance from herbivore refuges. (B) Mean (± s.e.) sedimentary OC stocks in subsurface (5–14 cm) sediments with increasing distance from herbivore refuges. We found that δ13C signatures of the sediments did not differ with distance or algal canopy height for either surface or subsurface sediments (all P > 0.05). Two-source mixing models showed that 43 ± 3% of OC originated from Enteromorpha spp., the dominant algae growing in the lagoon, while the other 57 ± 2% originated from Hydroclathrus sp. Trophic cascade theory predicts that predator effects should extend to influence C cycling in ecosystems. Yet, there has been little empirical evidence in natural ecosystems to support this hypothesis. We demonstrate that marine predators can influence long-term OC storage in marine sediments via a behaviorally-mediated trophic cascade. Here we show that sedimentary OC stocks were greater in high-predation risk zones (i.e., further from the reef) compared to low ones (i.e., closer to the reef). Greater OC stocks further from the reef arose from behavioral responses by herbivores to the fear of predation, which provided a refuge for macroalgae growing further from the reef, which in turn aided C accumulation in these sediments. Our results indicate that predators may help protect the accumulation and preservation of OC in marine sediments, raising concerns regarding trophic downgrading of marine ecosystems. We hypothesized that predators, via trophic cascades, were a major driver behind the development of grazing halos in Heron lagoon. One way in which predators can induce a trophic cascade is through direct consumption (Paine, 1980), which reduces prey abundance in locations where predation pressure is high (i.e., density-mediated trophic cascade). It is possible that a density-mediated cascade may be occurring in this system, i.e., predators may reduce herbivore density via consumption as herbivores venture away from the reef into unsheltered areas. In 311.5 h of remote daylight observation, we observed no successful attacks of predators on herbivores in the halo. Although these results could suggest that density-mediated effects are relatively weak in this system, it is important to note that our cameras captured only a limited field of view and were constrained to filming during daylight hours. Further studies investigating predation events, especially nocturnal predation events, are needed to determine the contribution of density-mediated trophic cascades on the presence and maintenance of grazing halos in our study system. Trophic cascades, however, are not always manifested through direct consumption. Trophic cascades can also arise from adaptive shifts in prey behavior that aim to minimize predation risk (Schmitz et al., 2004). Specifically, prey can allocate time differently to activities that vary in predation risk and feeding opportunity, or use vigilance to trade-off feeding rate and predation risk (Brown, 1999). These behaviorally-mediated trophic cascades can be as strong, or even stronger than, consumptive effects (Preisser et al., 2005; Hammill et al., 2015). To determine whether a behaviorally-mediated trophic cascade was occurring in Heron lagoon, we first investigated the abundance and behavior of predators (sharks and jacks) and herbivores in our system. We then determined whether herbivores were responding behaviorally to predator patterns in ways that are consistent with a top-down effect. According to Ideal Free Distribution theory, consumers with no perceived risk should allocate foraging time in proportion to food availability (Wirsing et al., 2007). However, where predation risk occurs, foraging theory predicts that animals should harvest fewer resources in habitats that are more exposed to predation risk (Brown and Kotler, 2004). We found that herbivore abundance (Figure 2B) and the amount of algae removed from grazing assays (Figure 3A) declined with distance from the reef edge. This pattern occurred despite the fact that highly-palatable benthic macroalgae was far more abundant at distances greater from patch reefs (Figures 3D,E). The fact that predator abundance, which was largely composed of roving predators, was also greatest near the reef (Figure 2A) highlights the complexity of predator-prey interactions. Naturally, predator abundance should be highest where their food source is greatest. Thus, prey must not only monitor the presence of predators to reduce predation risk, but also make decisions about when to flee based on a margin of safety. Theory on flight initiation distance (FID; the distance at which prey flee an approaching predator) shows that the margin of safety for a prey is based on its distance from a refuge, the predators distance from the refuge, and the prey's speed relative to the predator's (Cooper, 2016). As the prey's distance to the refuge increases, so does the FID. Thus, herbivores foraging further from the reef are at a greater risk of predation by roving predators than those foraging close to the reef. We did not observe any herbivores at distances >7.5 m from the reef edge, suggesting that this distance may be the FID threshold for our predator-prey species. To further support our hypothesis that herbivores in our system are responding to predation risk, we found that herbivores in Heron lagoon appeared to respond to temporal patterns in predator abundance by altering their abundances in an opposing way. We found that the abundance of large bodied predators on and around patch reefs were not consistent across high and low tides. Instead, predators appear to patrol patch reefs in the lagoon primarily at low tide when water depth is lowest, and all but vanish during high tide, when water depth is at its max (Figure 2A). This hunting behavior may be used to reduce the three-dimensional space in which prey can move, a known strategy employed by marine predators to increase the likelihood of capturing their prey (Heithaus et al., 2009). Conversely, herbivores were more abundant and ventured further from the reef edge at high tide when predator abundance was lowest (Figure 2B). Since net population sizes of predator and prey populations are not significantly increasing and decreasing due to births and deaths over the time scale of tidal cycles, predators and herbivores must be either migrating into and out of the lagoon with the tides or restricting their movements such that they are observed less frequently. 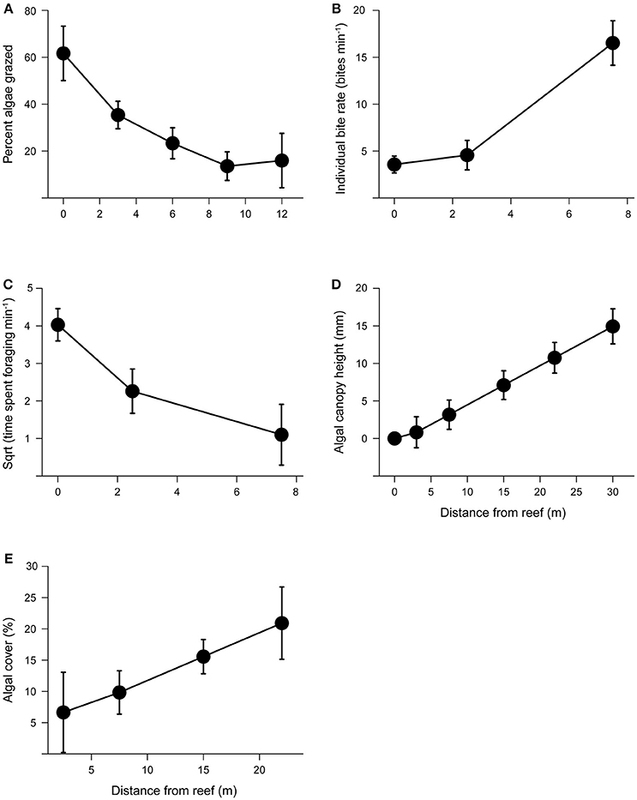 Finally, we found that herbivore individual bite rates increased with distance from the reef, but time spent foraging decreased (Figures 3B,C). There are two potential reason why herbivores would spend less time foraging further from the reef. First, the cost of energy spent foraging further from the reef is greater than the net energy gained from foraging in these food patches. 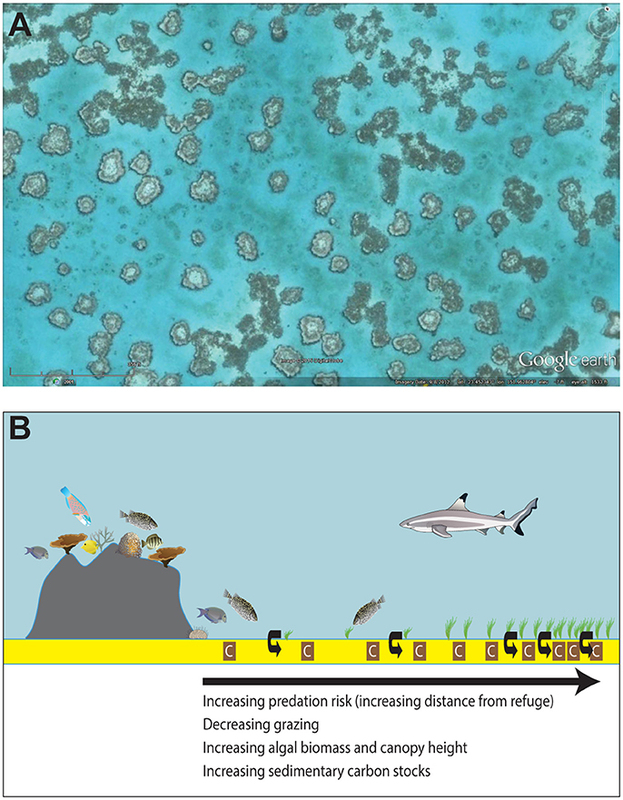 Second, the risk of predation at food patches further from the reef is higher than those closer to the reef; thus herbivores are trading foraging time for safety. Although we do not have giving-up densities for our system, a study conducted on similar herbivorous species found that over a distance of 30 m from a refuge, harvest rates by herbivores were dependent on resource availability (Gil et al., 2017). Thus, it is unlikely that the energetic costs of foraging further from the reef is driving the herbivore abundance patterns seen in Heron lagoon. Furthermore, the fact that herbivores increased their bite rates with increased distance from the reef suggests that herbivores are trying to maximize their food intake when foraging in these riskier areas. Overall, our results show that herbivores in Heron lagoon reduce predation risk through time allocation. Specifically, herbivores altered where they foraged, when they foraged, and for how long they foraged in different microhabitats. Consistent with a trophic cascade, these effects on herbivore foraging behavior resulted in an increase in algae with increasing distance from the reef. The observed changes in herbivore foraging intensity and its effects on the distribution of algae, subsequently had legacy effects on the spatial distribution of OC stocks in coastal marine sediments. OC stocks collected from surface sediments (0–5 cm), which represent OC storage over the past ~40 years, were positively affected by both algal canopy height and distance from the reef edge (Figure 4A). This resulted in surface OC stocks being up to 24% greater at 30 m from the reef's edge compared to adjacent to the reef. Subsurface OC stocks, which represent OC storage between ~40 and 110 years, had a curvilinear distribution with distance, where stocks remained relatively constant between 0 and 15 m from the reef edge, before increasing. Although we were unable to collect sediment cores from some of the deepest reefs (see section Materials and Methods above), consistent patterns in herbivore and predator behavior and abundance, as well as percent algal cover across the different patch reefs suggest that patterns in OC stocks should be similar in these areas. It is important to note that although we saw a positive effect of predators on sedimentary OC stocks in Heron lagoon, the direction of predator effects on OC storage is dependent on food chain length. The mechanisms behind halo formation in Heron lagoon appeared to be driven by interactions between species in an odd-numbered food chain (predator > herbivore > primary producer); thus we would predict that predators should have a net positive effect on primary producers and C storage. However, in even-numbered food chains, predators are predicted to have a net negative effect on primary producer, subsequently reducing OC storage (Schindler et al., 1997; Hammill et al., 2015). We found that δ13C signatures of the sediments did not differ with distance or algal canopy height for either surface or subsurface sediments. This homogeneity in δ13C signatures suggests that sources of OC to the sediments arise from the same basal resource regardless of distance from the reef or sediment age. Two-source mixing models using δ13C stable isotopic signatures for surface sediments showed that 43 ± 3% of OC originated from Enteromorpha spp., the dominant algae growing in the lagoon, while the other 57 ± 2% originated from Hydroclathrus sp. Although live Hydroclathrus sp. was not seen growing in the algal halos at the time of this study, large deposits of detached Hydroclathrus sp. are found throughout the algal beds in sand depressions. The contribution of autochthonous C to OC sediment pools can be highly variable in macrophyte systems, with past results ranging from >80% to < 50% (Kennedy et al., 2010; Reef et al., 2017). These results suggest that herbivores in Heron lagoon not only influence C storage by consuming autochthonous sources of OC to sediments (e.g., Enteromorpha spp. ), they also remove the structure (canopy height and density) by which allochthonous OC is captured. These findings shed light on some of the biotic processes that influence OC accumulation and retention in marine sediments, as well as provide important insights into the potential community- and ecosystem-level consequences of marine predator declines. We investigated several alternative hypothesis (sediment grain size, nutrient availability in the sediment, bioturbation, or water movement) for halo formation in Heron lagoon. However, we found no evidence to support these other hypotheses. First, although average algal cover immediately adjacent to patch reefs was far lower than algal cover farther from the reef, some individual patch reefs had an algal cover as high as 43% at the closest distance to the reef (2.5 m). This suggests that although algal growth was stunted near the reef, physiochemical conditions (e.g., grain size or wave action) close to the reef do not completely prevent growth. Second, neither sediment grain size nor total nitrogen concentration in the sediment showed a statistically significant effect on algal height. If nutrient levels in the water column were driving algal growth, we would expect more algae closer to the reef because of the greater availability of nutrients being transferred off the reef. Third, a study conducted concurrently with ours found no indication that benthic meiofauna were contributing to the patterns in algae (Ollivier et al., 2018). Finally, if water movement around the reef was responsible for the halo-type pattern in algal growth, we would expect asymmetrical radii of halos to be in accordance with the dominant direction of water flow. However, Madin et al. (2011) did not find any evidence of this for Heron lagoon halos. Although it is possible that other untested physical or biological factors are influencing the growth of algae close to the reef, it is clear that spatial differences in herbivore foraging intensity plays a major role in the formation and maintenance of grazing halos in Heron lagoon. Our ability to link trophic cascades in Heron lagoon with patterns in ancient OC stocks (e.g., subsurface stocks) is somewhat limited considering that the lagoon landscape could have been vastly different ~110 year ago when this deeper layer of OC was first accumulated. If trophic cascades 110 years ago were operating similar to current day cascades in this system, then the observed rapid increase in subsurface OC stocks beyond 15 m from the reef edge could suggest that this distance represents a long-term threshold for algal growth and OC accumulation. However, this would only be the case if our patch reefs maintained a similar size over the past ~110 years. In the GBR live coral colonies can expand linearly by ~6 cm yr−1 and dead corals can erode by as much as ~30 cm yr−1 (Ferrari et al., 2017). Thus, if our patch reefs grew or eroded over the past 110 years, our distances from the reef edge would not accurately represent historical distances. Furthermore, because we do not know whether historical halos existed at these patch reefs 110 years ago, it is unclear whether our results represent the effects of historical grazing on then OC stocks, or whether current grazing patterns are liberating ancient OC stocks close to the reef. Studies have shown that disturbances that decrease macrophyte density can lead to the rapid loss of sediment OC down to one meter deep in the sediment (Pendleton et al., 2012) by increasing microbial demineralization rates or by enhancing sediment resuspension and transportation (Lovelock et al., 2017). Regardless of the overall mechanism, our results suggest that current day predators protect OC stocks in Heron lagoon by creating high-risk predation zones that offer a refuge for algal growth and OC accumulation and retention in sediments. It is now widely recognized that human activities are responsible for rapid and large declines in aquatic and terrestrial predator populations (Pauly et al., 1998; Myers and Worm, 2003; Darimont et al., 2015; McCauley et al., 2015). However, despite the strong suggestion that the extirpation of predators can have far reaching effects on C cycling (Estes et al., 2011; Schmitz et al., 2014; Atwood et al., 2015), very few studies have explicitly documented this in natural ecosystems. Our study demonstrates that trophic cascades can indeed lead to dramatic legacy effects on relatively young and old OC stocks in ocean sediments. Unlike animals which offer only short-term (days to years) C storage potential and corals which actually act as net sources of CO2, marine sediments can “lockup” OC for thousands of years (Howard et al., 2017). Thus, our results suggest that changes to both marine predator and herbivore populations can have consequences for ocean C cycling. Furthermore, marine predators often have slow population growth rates, and recovery can take decades or longer (Hutchings and Reynolds, 2004). As a result, the consequences of marine predator declines on C cycles may be significant and long-lasting. Our empirical demonstration of the important role of predators and herbivores in structuring C processes in a natural marine ecosystem highlights that conservation of predators is critical and urgent, not just for their intrinsic value, but due to their role in regulating fundamental ecosystem services (Estes et al., 2011; Ritchie et al., 2012; Atwood et al., 2014a). TA, EM, AH, PM, and CL designed the study. TA, EM, AH, EH, and QO collected data. EM, OL, EH, and CR analyzed data. TA wrote the first draft of the manuscript. All authors contributed to the writing and editing of the manuscript. This research was funded by a Global Change Institute Seed Grant to TA, CL, and AH, an Australian Research Council DECRA Fellowship to EM (DE120102614), AH (DE120102459), and PM (DE130101084), a World Wildlife Fund Kathryn S. Fuller Science for Nature Fund awarded to EM, a US National Science Foundation International Postdoctoral Fellowship awarded to EM, and The Marine and Coastal Carbon Biogeochemistry Cluster. We would like to thank B. Sullivan, J.S. Madin, and E. Darling for help in the field. We would also like to thank the University of Hawaii at Hilo analytical lab for sample analyses. Symbols in Figure 1B are courtesy of the Integration and Application Network, University of Maryland Center for Environmental Science (ian.umces.edu/symbols/). We would also like to thank D.J. McCauley, J.A. Estes, and P.J. Mumby for comments on an earlier draft. This is contribution #100 of the Center for Coastal Oceans Research in the Institute for Water and Environment at Florida International University. Sedimentary carbon data is available at doi: 10.6084/m9.figshare.6828968. For data on fish abundances and behaviors please contact Elizabeth Madin at emadin@hawaii.edu. Brown, J. (1999). Vigilance, patch use and habitat selection: foraging under predation risk. Evol. Ecol. Res. 1, 49–71. Nelleman, C., Corcoran, E., Duarte, C. M., Valdes, L., De Young, C., Fonseca, L., et al. (2009). Blue Carbon: A Rapid Response Assessment. United Nationals Environment Programme. Pauly, D., Christensen, V., Dalsgaard, J., Froese, R., and Torres, F. (1998). Fishing down marine food webs. Science 279, 860–863. R Development Core Team (2016) R: A Language and Environment for Statistical Computing. Vienna: R Foundation for Statistical Computing. Smith, B. T., Frankel, E., and Jell, J. S. (1998). Lagoonal sediments and reef development on Heron Reef, southern Great Barrier Reef Province. Spec. Publ. Int. Assoc. Sedimentol. 25, 281–294. Copyright © 2018 Atwood, Madin, Harborne, Hammill, Luiz, Ollivier, Roelfsema, Macreadie and Lovelock. This is an open-access article distributed under the terms of the Creative Commons Attribution License (CC BY). The use, distribution or reproduction in other forums is permitted, provided the original author(s) and the copyright owner(s) are credited and that the original publication in this journal is cited, in accordance with accepted academic practice. No use, distribution or reproduction is permitted which does not comply with these terms.